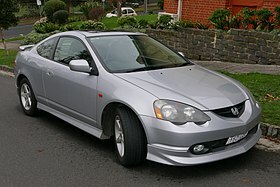 The Honda Integra (sauld in some mercats as Acura Integra an Rover 416i) is a automobile producit bi Japanese automobile manufacturer Honda frae 1985 tae 2006. It succeedit the Honda Quint as the slichtly lairger derivative o the Civic an each generation o the Integra wis derivit frae the contemporar generation o the Civic. Bein mair luxurious an sports-orientit than the Quint, the Integra wis ane o the launch models for Acura in 1986, alang wi the Legend. Throuoot its life, the Integra wis heichly regairdit for its handlin an performance. The Integra came in up tae five trim levels; RS, LS, GS, GS-R an Type-R, dependin on model year an mercat. The Integra name wis oreeginally uised bi Honda tae refer tae its VT250F motorcycle an is currently uised tae refer tae the scooter variant o its NC700 series o motorcycles. ↑ "Acura Owner Stories, Events & Articles | Acura Owners Site". Owners.acura.com. 3 January 2011. Retrieved 22 February 2017. ↑ Siler, Wes (9 November 2011). "The Honda Integra is back... as a scooter?!". Jalopnik. Retrieved 17 May 2012. Wikimedia Commons haes media relatit tae Honda Integra. This page wis last eeditit on 10 August 2017, at 22:34.